Hey all ya’ll, it’s Arush -to the top- a, here on Kilimanjaro, “Wooo!” (team cheers in background). It’s the 11th of July, about 8pm here, Tanzania time. 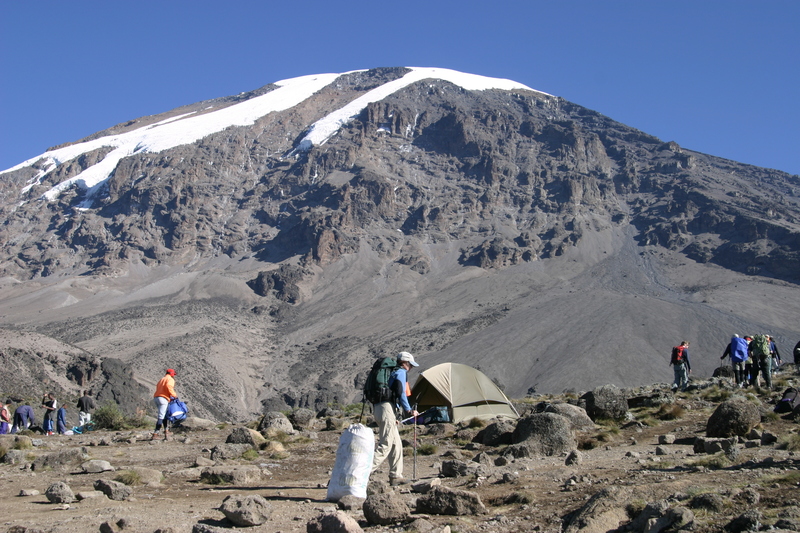 We’re on our 4th day of the trip and we’re at Karanga Camp, 13,300 feet above sea level. We’re all sitting here at the dinner table, all 16 or 17 of us, with our bellies full and feeling good. We had a nice day today, good weather, nice sunshine and Townes easily and comfortably dispatched his concerns of the Baranco Wall in good style, (cheers in background) he’s keeping us all inspired. We’re going to get a good night’s sleep tonight and then head up to High Camp tomorrow, on the 12th, in preparation for walking up to the roof of this mother. A couple of folks would like to say hello. Yeeha, thanks for following along everybody, we’ll give you a shout tomorrow from High Camp before our summit.